Jeff, Holly Beagle, and I at the summit of Ebbetts Pass. My 38th entry in Amy Johnson Crow’s “52 Ancestors in 52 Weeks family history blogging challenge. My 38th ancestor is my husband’s 2nd great grandfather, Leonard Jackson Harless (1858-1946). I first wrote about Leonard in a post last year about the anniversary of his birth in 1858. I have also written about his father Miles Washington Harless (1826-1891), who ties us in a round about way to the Hatfields and McCoys, about Leonard’s 2nd great grandfather Ferdinand Harless (1755-1853), and about his 4th great grandfather John Philip Harless (1716-1772), the first Harless from this line to immigrate to the colonies in America. A few years ago, I learned from published histories that Leonard was born “on the plains” in 1858 while his parents Miles Washington Harless and Margaret Gann (1830-1919) emigrated from Missouri to California. Leonard and his family crossed into California using the emigrant route that scales the Sierra Nevada range at Ebbetts Pass. The pass and parts of that original emigrant route now constitute a 61-mile long national scenic byway that includes Highways 4 and 89. The pass is usually closed November through March due to heavy snow, and vehicles over 25 feet long are not advised to travel the steepest parts of the eastern byway. The byway runs from Markleeville (Alpine County) in the east to Arnold (Calaveras County) in the west. I immediately wanted to travel this route! 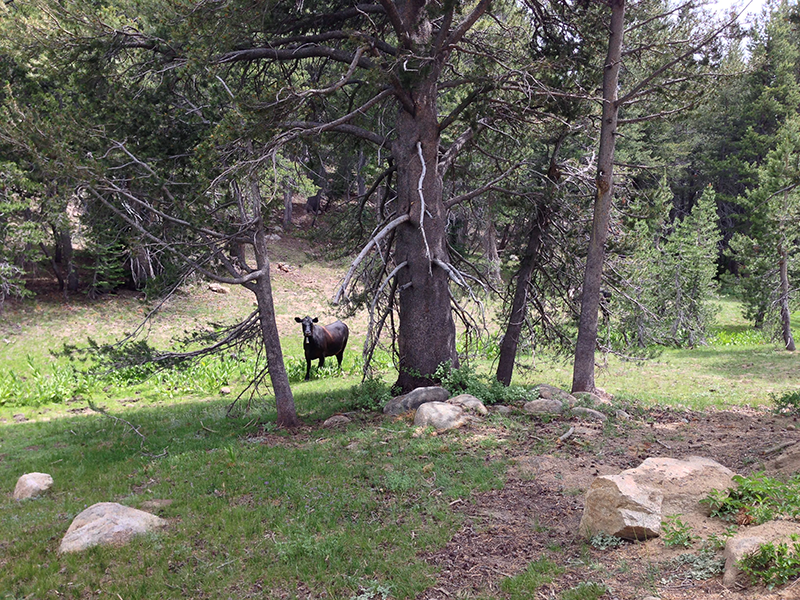 Jeff and I are huge outdoors buffs who are in heaven in the Sierra Nevada range. So a road trip up to Ebbetts Pass and back for a long weekend isn’t a chore for us. 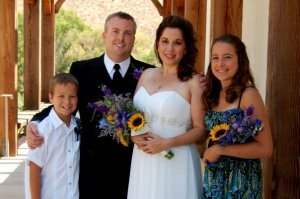 But, I wanted to put together more of the pieces of the Harless family’s history in their new California homes to make the most of the trip. 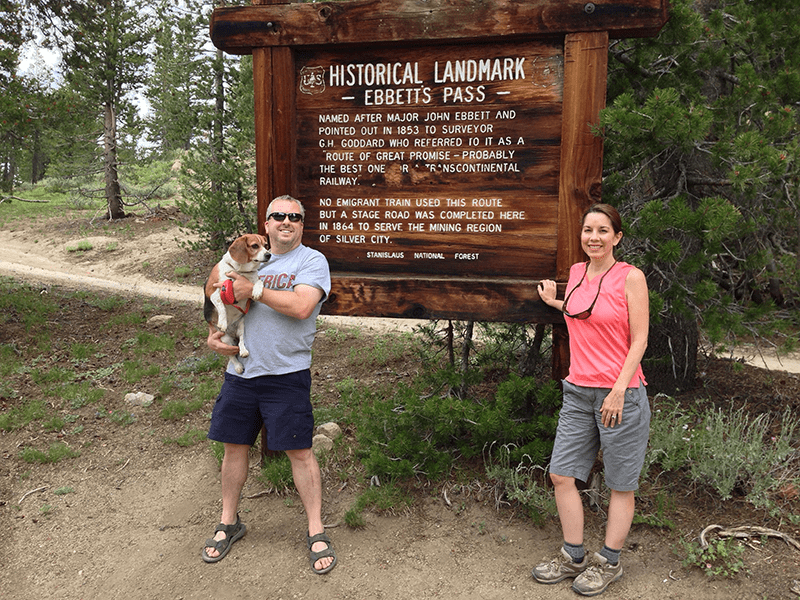 Jeff and I finally quit making excuses and took what morphed into a 10 day road trip this past July retracing his Harless ancestors’ steps across Ebbetts Pass and following where they migrated to in central California. These photos are highlights from the road trip across Ebbetts Pass, which pertain specifically to Leonard Jackson’s journey. I am working on a much longer, broader, more detailed write-up of the entire scenic byway for our outdoors blog, GreeneAdventures.com. Heading to Markleeville from our campground near Bridgeport. Firing up my iPhone’s Ancestry.com app, and taking screenshots of key facts before losing my data signal. Starting the western climb up from Markleeville. Aside from the paved road, did our Harless ancestors see this same view during the summer of 1858? Looking back towards Markleeville. Imagine making this climb in a wagon, on horse, or on foot? A stretch of the original emigrant trail. 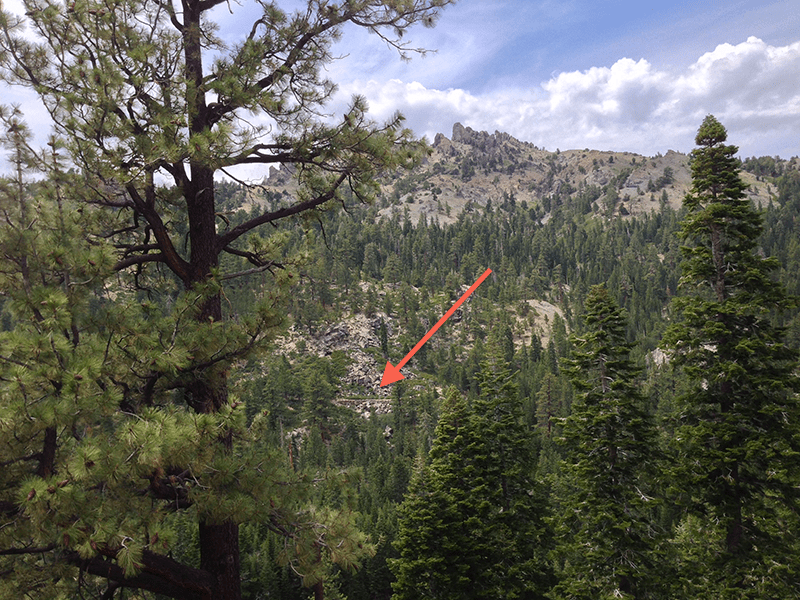 Yes… the VERY trail our Harless ancestors walked, crossing the Sierra Nevada range. Another view of the original emigrant trail, located across the valley from today’s paved road. Thankfully, the guide book clearly calls attention to where this can be seen, and there is a pull out to park and look. A pasture across from the landmark sign at the summit of Ebbetts Pass (see photo at the top of this post). Why this photo? If today’s cattle find it a pleasant enough spot to graze, might our Harless ancestors have stopped here too to water and feed their animals? A remaining piece of the original emigrant trail. 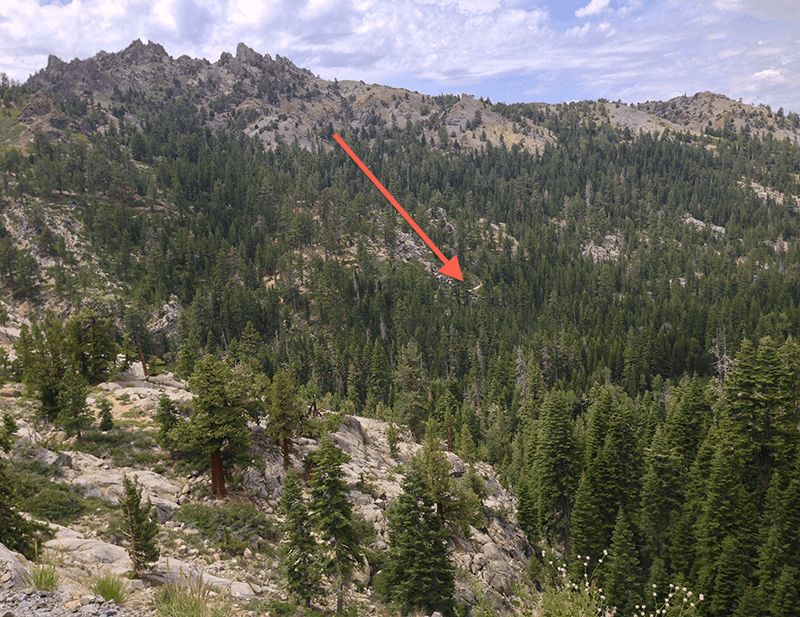 Located west of Alpine lake. It was beyond COOL for us to hike here…walking where Jeff’s ancestors walked in 1858. The wide path through the trees lends evidence to wagons trekking this route for years. God bless the ranger and volunteers who are signing and restoring still-accessible segments of the original Emigrant Trail for hikers and history nerds like us! The original emigrant route used to pass where Alpine Lake now rests. The former river was later dammed and flooded, causing the route (now the byway) to get moved. Jeff soaks in the gorgeous views of this serene lake, looking out over where his ancestors trekked in 1858. Another remaining stretch of the old emigrant trail. We had an incredible 10 day vacation. But, this journey across Ebbetts Pass and the old emigrant road was worth the whole trip! Very interesting!! I am Lura (Gann) Hewett, born and raised in Austin, TX. In 2002, I found out about the Gann Historical Society. Will enjoy reading more articles by you.